This entry was posted in Condiments & Snacks, Home-Made Pastas, Pasta/Rice/Soups (Primi Piatti), Vegetarian and tagged Cooking, Food, Italian, Maltagliati, Pasta, pesto recipe, Recipes by ChgoJohn. Bookmark the permalink. Never heard about Maltagliati before – love the no waste idea. Brilliant! Think I am going to have take some basil out of my Uncle’s garden to make your pesto – I will be kind enough to share some with him, promise. I’d have been surprised ,Mandy, if you were familiar with this pasta. One has to make quite a bit of pasta to have enough scraps for another meal. Even when they were making pasta for the families, Mom & Zia never had enough for a dinner of maltagliati. Mom cut the scraps into quadretti for soup and stored them until she had enough. Being small, she didn’t have to worry about them breaking as she would maltagliati. The good thing about this pesto is that you won’t need to take all of your Uncle’s basil. Just be sure to take some parsley, too, and you’ll be all set. 🙂 Hope yours is a great week, too. I wonder if this is the same as pasta rags.. Something that my father made a lot while I was growing up. I just asked him for his recipe last week! This is a beautiful thing… There is something about a jar of fresh basil that will just put happy in your heart! I ordered my box from Mary the other day! Hello! I’m not familiar with a “little rags” pasta. 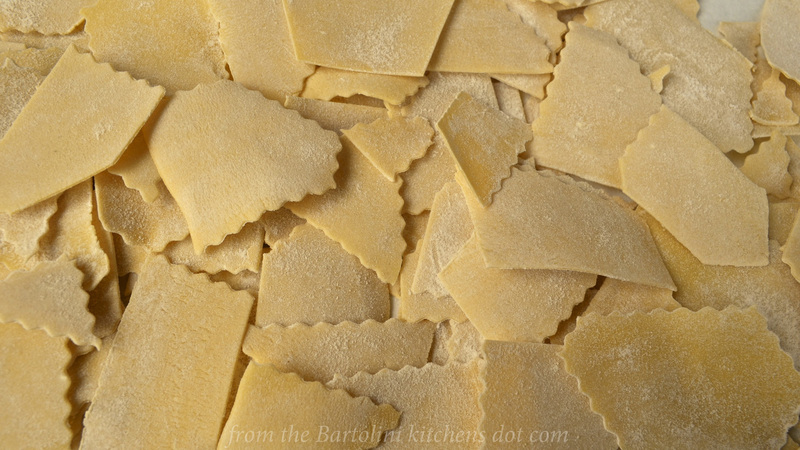 I’ve posted a recipe for “fazzoletti” pasta , little handkerchiefs. I know of another dish, stacciatella, which means little rags but it’s not pasta. It’s a soup with eggs stirred in. I’d be very interested to learn of the pasta your Dad makes. Aren’t these old recipes the best? I love ’em! 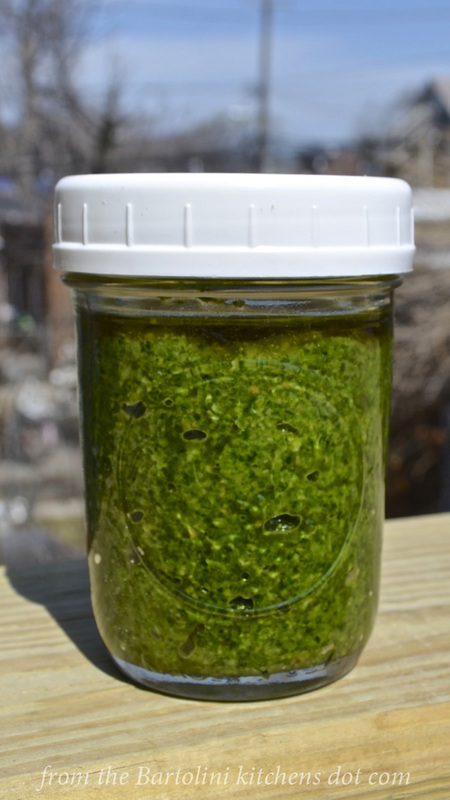 Using parsley in this pesto keeps it bright green, where a pesto with 100% basil will darken when exposed to the air. Thanks for the visit and for taking the time to comment. I just “followed” your blog and look forward to exploring it. Gorgeous! I’ll have to try this pesto. As much as I love pistachios I’never used them in my pasta recipes. Only walnuts and pinoli. Time to branch out I suppose. Clever man! When you perfect the fish dish you’re pondering let me know. What an excellent post John. So interesting about the differences in the way people eat and so sad about the food waste. I know it’s the same in England but I’m glad to say that folk like us who were taught well not to waste food are able to cook and enjoy marvellous dishes like this. In Spain there is a similar pasta dish which translates as something like “old rags” which uses all the odds and ends too! Love that pesto – what a beautiful vibrant colour and I bet it tatses amazing with the pistachio nuts. I tend to use almonds here in Spain to make mine as pine nuts are ridiculously expensive. “Make do and mend”, as our Nonnas taught us! Thanks, Tanya. It really is amazing what you can do in the kitchen with just the ingredients you have on hand. Only when I took a real interest in cooking did I realize the wisdom behind so much of Mom and Zia’s cooking. To this day, Zia throws very little away. Even when they were making pasta for their families, though, they never had enough scraps for a separate dinner. They made quadretti for soup instead of maltagliati. Another commenter mentioned that her father made a “rags” pasta, too. The only “rags” I know of is stracciatella soup and that’s not pasta. I hope she’ll post the recipe. The green of this pesto comes from the parsley. It doesn’t darken like basil does when it’s chopped and exposed to the air. I do like the look of it and the pistachio nuts are a nice change — and will leave you with plenty of change in your pocket, too. Pignoli are getting too expensive. Have a great week! With winter closing in at a rapid rate, I have a stock of frozen pesto to get me through until next season. Great idea to make maltagliata by breaking up lasagne. Yes, I stock up, too but, by this time of the year, I’m run out of everything but jam. Luckily, our farmers markets will open at month-end and the process starts all over again. In Italy, you can actually buy maltagliati now, something that would have been unheard of years ago. Thank you for posting this. I just pulled the last of my pesto out of the freezer this past weekend. I never thought about using pistachio’s though. I have been making my own pasta for about a year now and I don’t think I can go back–such great flavor! Can’t wait to try this! The price of pine nuts is finally coming down a bit here. I love them toasted and I know I’d love this pistachio pesto too. I am feeling really guilty. I have never saved the pasta ends. I won’t forget this post! Glad to hear , Maureen, that your pine nuts are less expensive now. Maybe ours will follow suit. We can get some cheaper but they’re imported and most are off-tasting. You’re right, though. They”re so good toasted. I love to use them as garnish for a number of dishes. May be a lonely crocus but it sure cheered me up and put a smile on my face. Great idea with the pistachio pesto, will this freeze well? Yes, Norma, it freezes just like normal pesto. That lonely crocus has been joined by many others, though not nearly as many as in years past. I lost quite a few plants over the Winter, including my bearded iris bed and an azalea. Right now, I’m anxiously checking the roses, looking for any signs of life. I fret over them every Spring until I see buds appear. Do you think you’ve lost any of your plants over the Winter? I sincerely hope not. Have not gone out to the garden to check, am sure there are major winter and deer damages. Hoping I feel up to taking a tour of the garden later in the week. Thank you. What a coincidence that we were both served maltagliati in Rome! When I was there the last time, I’d look on the menu for the oddest pasta name, ask the waiter about it, and order it. I never had a bad meal and often heard a great story, like for strozzapreti. And I so agree about the gelato. Pistachio gelato is the best. Your “maltagliati” are very well cut, John! And your pesto must be wonderful. Thank you, Sivla. In our climate this time of year, fresh basil is more expensive than normal. I love the taste of parsley, so, I don’t mind using it to make this pesto. In a few weeks, we will have plenty of locally grown basil and I’ll go back to making Pesto alla Genovese. I’m so glad you shared both recipes John; the Hungarian kitchen (and by default, my kitchen) operate with the same mandate, no food is wasted! Your left over pasta bits remind me of a recipe my Aunt Ági made with left over crêpes (which she collected in the freezer until she had enough)! She cut them into thin strips and added them to a gorgeous sauce of mushrooms and butter and served it as a side! How clever is that? I have a huge bag of Chinese pine nuts in the freezer that I bought from Costco, well before I realized where they were from. Fortunately we haven’t experienced the off putting metallic taste from these (yet), but I will ask my friend Barb to pick up some Italian pine nuts this summer when she and her hubby take their girls to Italy to celebrate their 10 year anniversary just so I can taste the difference. Making pesto with Italian pine nuts is such a luxury. I didn’t realize authentic pesto had parsley in it too, interesting; I wonder if basil was more expensive back in the day? I freeze my pesto in an ice cube tray and that way my portions are small enough to use as a pizza base (damn good) or two or three for something else! I use freshly grated Parmesan and I haven’t noticed a consistency issue, what happens? I’m so envious of your beautiful crocus! Our ground is still frozen, in fact we still have an enormous chunk of ice under the outdoor dining area! And its got many of the fallen branches firmly in its grip so it looks quite dishevelled back there. I hope you have a beautiful week. I’m going to be making your Easter cheese bread again next week, I’m always thinking of you when I do! There’s a lot of wisdom connected with limiting our food waste. If we tell ourselves that we won’t throw anything away, we’re forced to be a bit more creative. Your Aunt’s use of crêpes is pure genius! I pine nus could be grown in abundance here. There have been so many questions raised about imported foods that I’m leery about them. Just so there’s no misunderstanding, the pesto that most of us make, Pesto alla Genovese, uses only basil. There are plenty of other pestos, depending upon where you are in Italy. I use parsley here because basil is expensive this time of year — and I do like the taste of parsley. In a month, out markets will be open and I’ll be flooded with all the basil I could possible want. You’ve still got ice? Wow! Hopefully, you’re getting some of this warm air we’re enjoying and it will melt the last of it, though colder temps are coming back to start next week, Yes, that poor little crocus stood alone. It’s gone now but many others have opened. Still, only about 50% have opened. It looks like I lost a few over the Winter, along with the bearded iris, and an azalea. Now, I’m just watching and hoping that my roses come back. There’s still no signs of life but it’s still early. I’ve been checking them daily. I’d hate to lose any of them but this was a tough Winter. Have a great weekend, Eva. I am so looking forward to pesto sauces. I love it on pasta and especially on grilled pizza. We planted the garden last weekend and the basil is growing! I can’t wait. This pasta looks wonderful. I have not made it before, but I have done the torn lasagna noodles. I still someday I will make pasta from scratch. Perhaps a spring break project with the kids…. Looks good but I’d have to leave out the pistachios. Awaiting the shanks – yum!! All nuts, no can do! But the shanks are a go. Pistachio pesto!!!! you know how to melt my heart…..
Oooooooh! What a divine recipe–complete with step-by-step photographs. I think your post is the final push for me to get a pasta maker! I’m glad you liked today’s recipe, Celi, and thanks for taking th time to check out her offer. Spring is here, too, but I it’s still not warm enough for me to open windows yet. It has to get into the mid-70s before I can open up the place. Mustn’t let Lucy catch cold. Believe me, I am so looking forward to that day! Go for it, MD. I think you’ll like the parley in the mix. It brightens the color and you can certainly taste it, along with the basil. I love the flavour pistachios and will definitely try your version. I have a question: in Switzerland pistachios are more expensive than pine nuts… is it the contrary in the States? I have a couple of soup recipes that make use of pasta ends, but not an actual pasta dish. This looks great! And I’m so ready for spring, so the pesto looks terrific! Can’t get enough of that stuff! Good post — I always like twofers! Thanks. Thanks, John. Yes, never throw away any bits of pasta. It’s amazing what can be done with them. And if you haven’t enough, sacrifice a few good noodles for the greater good. The parsley helps this pesto keep its vibrant color. nice to see in February/March. We’ve just had 3 really nice days and it feels so good to just sit outside again. Of course, things will change tomorrow afternoon but that’s not right now. Spring has arrived! No words ,John, only my mouth is keeping open…..great!! One time I wanted to make this kind of rustic dish and I opened up a box of lasagne noodles and did exactly like you said! Actually, it was the pasta dish I made with your mascarpone cheese! It was SO good. This pesto looks pretty amazing too! Love the green colour of pesto but the pistachios make it even more vibrant. I have made pesto with almonds before but not pistachio, so, time to try something new. The girls love pesto. Love the crocus! We’re seeing some here now, its so nice to see colour after the drab of winter. Have a great week, John! Hello, Nazneen. I bet you didn’t know that the broken lasagna noodles were called Maltagliati. Neither did I until I visited Italy with Zia. 🙂 The pistachio nuts and parsley do help to give this pesto a great color. Best of all, it doesn’t darken like pesto made with 100% basil.BTW, your daughters sounds like very wise, discerning young ladies. We’ve had 3 glorious days, and there are many more crocus in bloom now. Of course, this being Chicago, it’s all going to change and temps will drop 30˚ tomorrow afternoon. We’ve had 3 days, though, and the promise of many more to come. I hope you all are having a fantastic weekend, Nanzneen. Love the simplicity of the dish, and the fresh pesto. I’ve only used walnuts and pistachios in my pestos, along with pine nuts. I’ve considered using almonds but cashews? I bet both are wonderful. I’ve only used basil, parsley, and mint, too. You’ve got me wanting to try other greens now. Thanks for the inspiration. Lovely, simple food John. Though, I have to say, I am looking forward to the lamb shank. They appear to be in season! Thanks, Conor. I didn’t want to say anything on your post but, yes, with Spring and Easter in the air, many of us automatically think lamb. I cook shanks twice yearly. Once in the Fall, it’s my welcome cold weather meal, and again it the Spring. Same welcoming idea but this time it’s for warm weather. I will say, though, that those shanks you prepared sound so very good. Your spice mix is fantastic. I think I’ll give them a try this Fall. Pistachio pesto is my all-time favorite pesto and your recipe looks divine John. I love that scraps of pasta get used and enjoyed with this dish. Something so satisfying about using off cuts and left overs. Lovely pasta as always John. Thanks, Caroline. If you’ve made pasta at home, this is by far the easiest to make. Roll it out and cut it any way you like. There is no wrong way and, just like any homemade pasta, it tastes great! I usually have maltagliati left when I make ravioli, although I sometimes just knead the trimmings into a ball and run it through the machine again to make more ravioli. Thanks for explaining why cheese should not be added to pesto before freezing. I know about that, but not why. Sadly, pesto made by hand is so much better than in the food processor. I wish it weren’t so as I don’t like using a mortar and pestle. But I compared them side by side and the difference was very clear. Thanks, Stefan. De[ending upon the amount of dough scraps, I’ll either make more ravioli or some kind of pasta with them. In Winter, it’s almost always quadretti for soup. Lovely and delicious…I’m deeply in love with pistachio pesto!!!! I love that no-waste approach to cooking (although sadly I don’t practice it well enough).Your pasta looks so delicious! It’s fun to make pestos with all sorts of ingredients; they really make a simple dish sing. 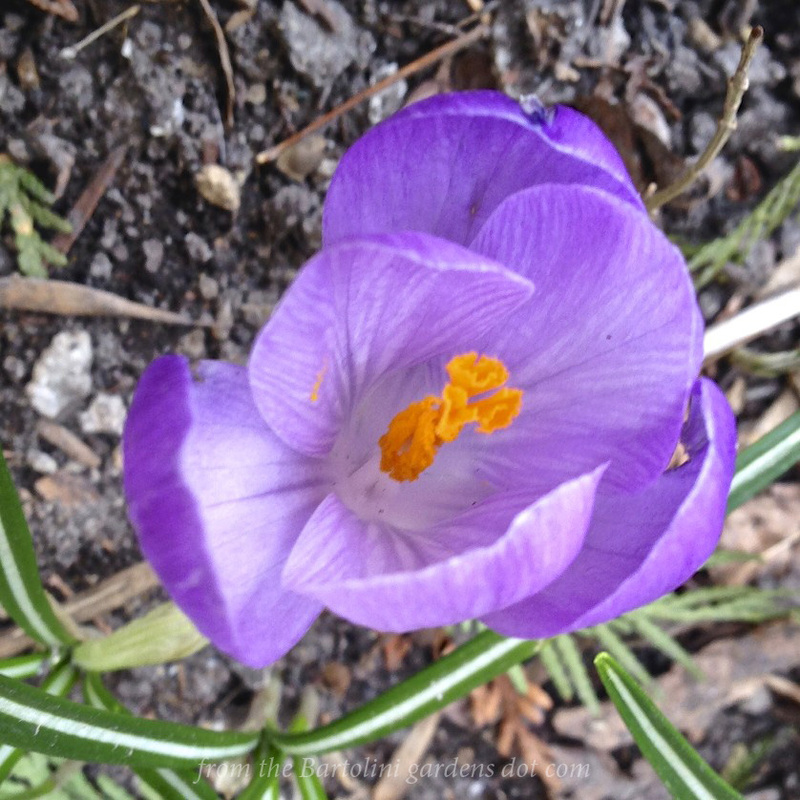 And your crocus makes my heart sing … could it be that spring is finally here? It was a glorious day yesterday and earlier today, but clouding over now. No matter, we got out on the motorcycle for a nice tour through the countryside this afternoon. Also stopped for some groceries; must choose wisely when there’s so little room to carry things home! Yum, the pistachio pesto looks amazing. I’m definitely going to try your recipe! I’ll have to ask my aunts if they call this pasta the samething, you know how it is with different dialects depending on the region! Dare I admit it? I’m just not that thrilled with regular pesto. I mean, it’s OK, but I just don’t love it. Pistachios, though???? Brilliant! Can’t wait to try. Hello, Eha. Glad you enjoyed the post. I believe, though, that you’ve mistaken one of my posts for Stefan’s. The post I wrote was for fazzoletti or “little handkerchiefs”. Those are square, purposefully made; and you can see my post HERE. Maltagliati are really just scraps. 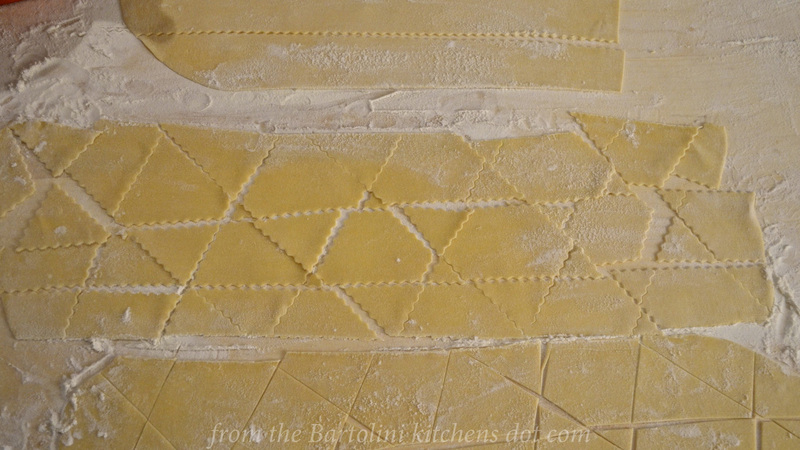 There is no way I would ever make enough pasta to have sufficient scraps for a meal, so, I made pasta and cut it to resemble maltagliati. 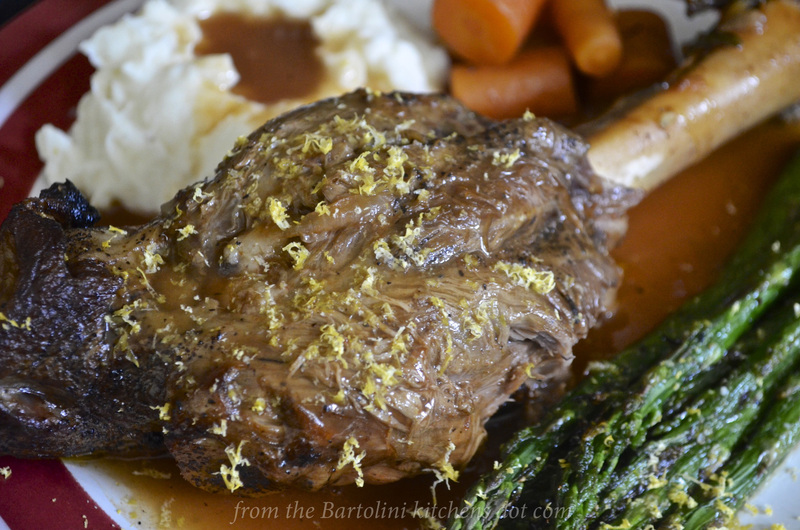 Yes, it does seem like lamb shanks are making the rounds, doesn’t it? Spring or Easter probably has something to do with it. You’re correct and that is lemon rind used as a garnish. I saw a TV chef do it and I’ve been following his lead. A little bit of citrus zest really does have a nice effect. I hope you’re having a great weekend! What a wonderful dish, John! Being genovese myself, I obviously ADORE pesto! Of course, I used to have it more often with trofie pasta, trenette, gnocchi or even lasagne, which were the types of pasta that were traditionally used in Liguria, but nowadays on this side of the pond pretty much any kind of pasta will do! 😉 My favorite way of having a pesto dish was the über traditional Genoese way, served with boiled potato bits and string beans. You sure brought back many memories… And made me hungry! I also enjoyed reading the stats that you mentioned about average pasta consumption here and there. And, I am absolutely with you regarding the humongous portions that many restaurants, diners (or even sandwich stores for that matter!) generally serve here in the US and the effects that this may have on consumers’ weight. Thanks, Stefano. I’ve enjoyed pesto served the traditional way, with potato and beans. What a wonderful dish! It skirts the line between pasta and salad and I loved it. In this country, we really do need to re-think our dining habits. A good place to start would be restaurant portions. Very often they’re large enough to feed 2 adults. A little less and we’ll all be better off. Your crocus bloom is so full of hope for Spring. And I like your promo for the surprise box! I am going to order one for a friend in Omaha for her Bday. Thanks for all the likes and comments on the blog. I am sharing your post today with some of your fans! Have a lovely Easter week. My sister is coming in on the train and we are headed to Rockford to visit our 98 yo aunt! Hi, Ruth. That little crocus has been joined by a number of others now. We’re just finishing our 3rd day of wonderful weather. Naturally, tomorrow things will change but we’ve had a wonderful glimpse of things to come. Thanks for sharing this post, Ruth. You really are one of my biggest supporters and I appreciate it. I’ve no big plans for Easter this year. I’ll make up for it, though. I hope you have a wonderful holiday and enjoy Easter with your Sister and Aunt. Buon viaggio! There’s so much to love in this post! First of all, do you think Malta is so named because it is a mix of cultures? Just wondering.. I love the whole idea of gathering up scraps for a unique pasta dish of its own. I have also wondered how there can be so many dishes in Italy, now I know it’s all about portions. Your family’s meals are like our gourmet tasting menus I think. Small portions and lots of variety.. and of course, lots of wine;) Or maybe that’s just me? And those pine nuts… can you believe the cost??!! I think it’s crazy! I’m glad you’ve found the perfect substitute, pistachios are the loveliest light touch of green! Hello, Barb. I’ve no idea where the name “Malta” came from. Sue would be interesting if it did come about as you’ve suggested. I don’t wish to mislead you. Although my family ate a primo piatto on special occasions and holidays. most often our dinner table looked like anyone else’s, though there was often a pasta of some sort being served, often in place of potatoes. One of our Italian chefs speaks of a region in Italy where they serve as many as 30 courses for a big celebration. I cannot begin to imagine what that must be like and I really do not wish to find out. Hope you’re having a great weekend, Barb. So happy to hear that your spring has finally arrived John – about time too! I love the idea of this pistachio pesto and will be giving it a go with our last remaining basil from the garden. It’s wet and miserable here today… winter is well on it’s way! Your crocus looks beautiful John. No sign of flowers here yet – but we are hoping for warmer temps soon. Now I am not a fan of parsley as you know, but this pesto sauce looks terribly inspiring, inviting and mouthwatering. I am especially intrigued by the use of pista nuts. Need to try this, especially as my kids adore pasta. There’s never been a time when I’ve visited your blog without a mouth watering response to your recipes! Everything always looks so delicious. I’m going to have to add parsley to my basil next time I make a batch. I try to keep it on hand in the freezer at all times. Usually its made with basil, spinach, sometimes kale, walnuts, garlic, a little lemon juice, and olive oil. Of course being allergic to dairy the cheese is a no-no and for some reason pistachios and pine nuts make me itch! Your Crocus is gorgeous and such a good promise of warmer weather to come. We’re just now dipping out toe into spring in New Hampshire. It has been a LONG winter. We still have patches of snow in the shady areas but over the next couple of weeks we’re promised warmer weather. I never knew that this pasta actually had a name & now I know. The pistachio pesto sounds fantastic – you know I’ve never made pesto before but you’ve convinced me that I can do it. After some very heavy rains, we’ve finally gotten rid of our snow here & my bulbs are just starting to peak through – no blooms yet, but soon so there is hope. I really enjoyed reading this post – and the pistachio pesto sounds wonderful. I love pesto and I love pistachios so it’s perfect for me! Your point about the pasta serving sizes is a good one – I’m always shocked by the size of the servings of pasta in the US. We are influenced by Europe here in the UK and the servings of pasta are much smaller here. Pistachio Pesto sure has a nice ring to it! As does maltagliati. Sometimes when no one is around I love to say Italian words out loud. They just roll off your tongue and are so much fun to say. Yes, I am a bit strange! This sounds like a lovely dish and I do want to know about your dad and dandelions, but I think the link got mixed up because I’m just seeing linguini with clam sauce and though that looks lovely, it has no dandelions! Happy Spring, John! Thanks for the heads-up regarding the link, I fixed it. Here it is again, so, that you needn’t go searching for it. 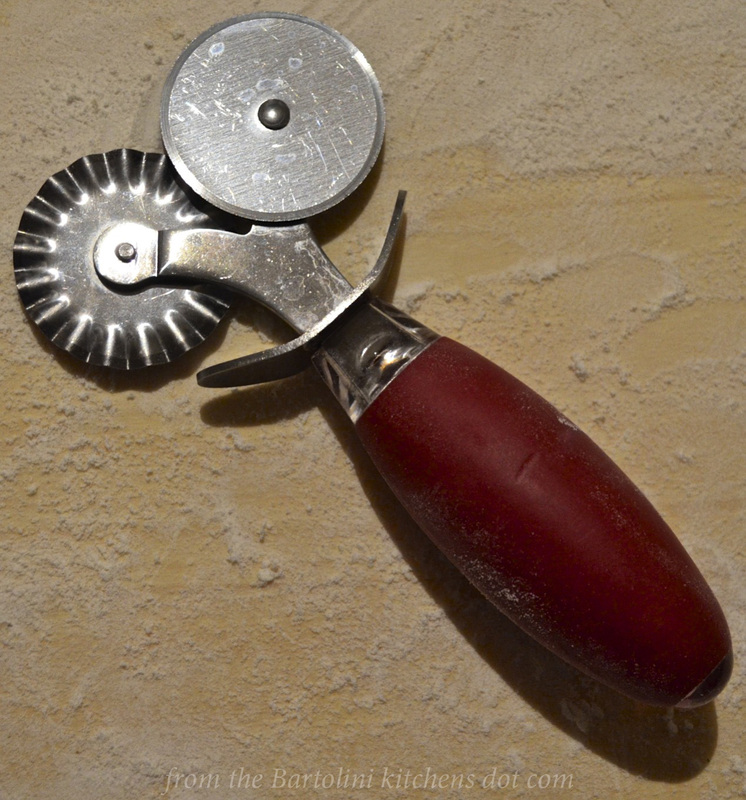 Maltagliati simply means badly cut, as the two parts of the word suggest. I have nver tried pesto with pistachio nuts- an interesting idea. Thanks, Francesca, for the correction. Even though my knowledge of Italian is quite limited, it’s so obvious that I should have caught that. Thanks again. I am a translator so what seems obvious to me isn’t so obvious to others. I love the look of that dish! Love the pesto – have never used pistachios before. Going to get my three little ones cracking some shells for me – great activity for a rainy day! Bouno Sera John! Holy cow 59 pounds of pasta! Thats a lot of pasta! I would love all 59 pounds of it slathered in your pistachio pesto. Pine nuts are really expensive in HK too. Well actually like all food and nuts are expensive here but pine nuts, especially. Pistachios are sweet and naturally green. Love that photo shot of your pesto outdoors with blue skies. We had pasta and pesto tonight — possibly from having seen the e-mail announcing your post two days ago! The link didn’t work for some reason, sorry I’m late (puff, puff…). I usually substitute sunflower seeds for pine nuts. I like your idea of pistachios, though, to add to the bright green colour of the pesto. And speaking of bright colours, congratulations on your first crocus this year! Happy Spring. Definitely making your pesto as a surprise for Liz. Any chance you could just send me a few boxes of your pasta??? 😉 Hope you’re enjoying spring my friend! A beautiful post. Lovely pasta, and I appreciate that you include both basil and parsley in this pesto. Parsley adds so much freshness. Thank you! I have never had pistachio pesto before and there is no doubt I would love it. Pistachio’s are my favorite nuts. Lovely post John. First day back from long business trip. What a comforting meal to come home to, even if it is virtual! Love the riff on Pesto, often use other nuts and herbs for fresh taste of summer. Nice work John. Love pistachios … who knew they made such a wonderful addition to classic pesto (and not so classic pesto too!). Bravo! I’ll eat these craps any day! I never use pine nuts. Never thought they were worth the price. I love your substitute. I’ve been literally walking from Ontario to Chicago, that’s why I took so long (LOL). I have been popping in and out and seeing so many great recipes here. Your cooking is now very, very, many, notches higher and the photography is gleaming. We all hope, one day, we shall become Master Chefs…Thank you for explaining what Maltagliati means. It makes more sense to me now. Nothing is ever wasted in my kitchen either, that’s why I’m fond of soups. A great way to use up left over, but still fresh, ingredients. Oh yes one pound, is never for 8 people here…I am a mega-serving-supporter. Lucky you, you have that single Crocus. I’ve nothing. My snow has just finished melting. I can finally see the grass. 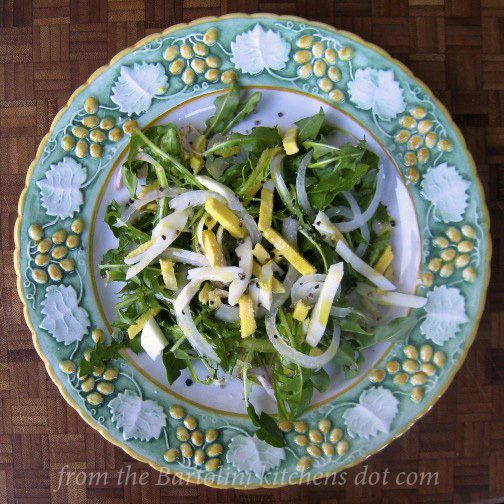 Maybe soon I’ll be having lots of dandelion salad (LOL). For me snapping up some store-bought lasagna noodles is the way to go. I’m way too lazy, John. 40g basil? I have to find a farmers market. I love the sound of the pesto. I’m definitely gonna try it. Thanks for giving metric measures. I’ve never fully comprehended “a handful of herbs”. 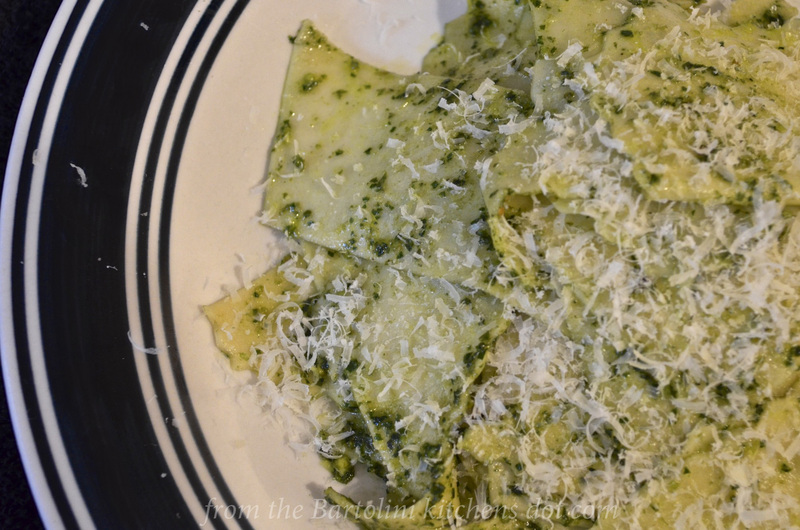 As soon as I get my hands on basil, I shall make this pesto and enjoy some snapped up lasagna noodles. Thanks John for being so patient. I shall visit you again, tomorrow. Enjoy the week. Temperatures are lovely but slowly turning into freezing rain and snow in the afternoon. What a mess! Warm regards to Max. Best wishes! I need to buy a pasta machine, first of all. This recipe is truly intriguing. I loved the pistachio pesto: this is the first time I am hearing about a pesto with pistachio nuts. I generally make it with pine nuts. But making the pesto with pistachios makes more sense in India, as pine nuts are really not easily available and pistachios are very common here. Your pasta looks delicious! That lamb shank picture is going to make me more greedy! Hello crocus! How lovely to have the first one out on your lawn, John – that must have brought a smile. I love the back stories you always have to share with your recipes. We used to make pasta regularly and my kids loved all of the different shapes and the whole messy process. Such a fun thing to do. I’ve never tried pistachios in pesto, but I frequently use walnuts in a chard pesto when we’re in the growing season. I’ve got Genovese and Red Opal basil growing on my window sill and think I’ll try your recipe with the pistachios! A delicious unforgettable Spring treat! Always a taste bud adventure visiting your blog. All the best to you and your family. Mr. N would certainly love the pistachio pesto (Mike too). Mr. N though – he’d devour it and ask for it on the pasta, on flat bread, etc. for days. The pasta looks great and you know it wouldn’t take long to eat it all here. I’ve been known to put away 1/2 lb. to 3/4 lb. of pasta in one sitting – thus why I can’t have it on our menu too often. No self control with pasta I tell you. None. Thanks for the breaking lasagna noodle idea. That’s a great time saver! I, too, have no self-control when it comes to pasta, Kristy. I used to make enough for my supper, with some left over for the next day’s lunch. Well, good in theory but bad in execution. Somehow, by the time I went to bed, “lunch” would disappear, forkful by forkful. This pesto is great for a change. The parsley and pistachios give it a slightly different flavor and a welcome change.